No respectable financial advisor would discourage an investor from becoming educated regarding investment products and financial services. An informed investor is able to do much of the initial investment research themselves, placing less responsibility upon a financial advisor. But investor knowledge is a tricky component of the investor-advisor relationship. Many investors do not use financial advisors because they believe they can do a better job investing than the professional, and without the cost of paying the fees which come with advisor usage. This point is driven home in Spectrem’s new perspective Knowledge, Risk and Advisor Dependency, which demonstrates the solid relationship between an investor’s knowledge level, risk tolerance and dependence on professional assistance. In general, the less an investor knows, the less willing that investor is to make investment risks and the more likely that investor is to depend on the services of a financial advisor. The opposite also holds true, that a knowledgeable investor is more likely to take risks with investable assets, and is less likely to depend on, or even use, a financial advisor. The study shows that the difference between investors based on their investment knowledge and advisor usage is pronounced. Among all investors with a net worth of more than $100,000, only 61 percent of those who claim to be “very knowledgeable’’ use an advisor. 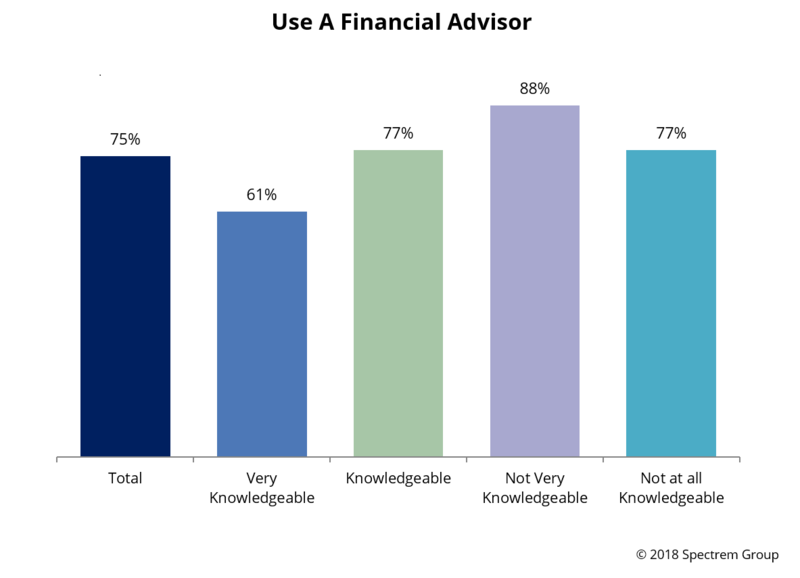 That percentage climbs to 88 percent of those who claim to be “not very knowledgeable.’’ Obviously, knowledge does not preclude advisor usage, but it makes advisor usage less desirable or necessary in the minds of investors, apparently. It is not the desire to avoid fees that causes a knowledgeable investor to not use a financial advisor. Among those investors who claim to be very knowledgeable about investment products and personal finances and do not use an advisor, only 3 percent claim they cannot afford to work with an advisor. Instead, 69 percent of those investors believe they can do a better job investing than a professional can. With knowledge comes self-confidence, and with self-confidence comes the belief that an investor can make just as much money by themselves as they would make with professional assistance. Almost 50 percent of the very knowledgeable investors who do not use an advisor do not believe a financial advisor works in the best interests of the client, but that is a standard percentage among all investors, no matter their knowledge level. The research again begs the question: Do advisors want their clients to gain knowledge if in doing so they become less dependent upon their advisor? It is noteworthy that the percentage of investors who claim to be very knowledgeable and use an advisor is the same (61 percent) as those investors who claim to be most aggressive in their investment decisions and use an advisor. The correlation between knowledge and risk tolerance shows up in multiple ways in the Spectrem study. There are two groups of investors for advisors to consider when thinking about the results of the Spectrem study. The first are those investors who are already clients but who want to become more knowledgeable about investment products and personal finances. If the relationship is strong and beneficial to the investor, it is likely additional education will not negatively impact that relationship. The second group to consider are prospective clients who claim to be knowledgeable. Advisors must be able to prove they can be beneficial to the investor beyond the level of compensation in order to overcome the belief among those knowledgeable investors that they can do the job just as well without worrying about compensation.